Mike Adams, Director of Instruction at Hamilton Farm, is a three-time New Jersey Section Teacher of the Year winner and this year, was an inductee for the World Golf Teachers Hall of Fame. Adams has taught PGA, LPGA, European, Champions Web.com Tour players, and former U.S. President’s such as Gerald Ford, George H.W. Bush, Bill Clinton, and George W. Bush. He is consistently recognized as one of the top 50 instructors in Golf Digest and top 100 teachers in Golf Magazine. 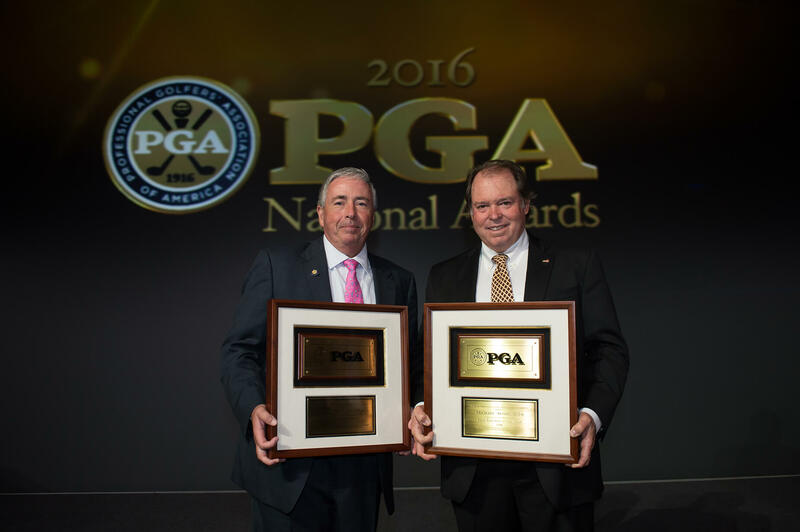 Bryan Jones of Black Oak Golf Club, a 22-year PGA Member, former Board of Directors member and four-time New Jersey PGA Special Award winner was given the National Horton Smith Award. Jones has served as the Section’s President, Vice President, Secretary, and Honorary President. He has also served as President of the New Jersey Golf Foundation. Special Awards Videos Jones has helped aspiring PGA Professionals learn the rules of golf, and has also served as a rules official for the Ryder Cup and PGA Championship. Jones has helped aspiring PGA Professionals learn the rules of golf, and has served as a rules official at the Ryder Cup and PGA Championship.